Having unique prenuptial and wedding photos can be quite a challenge. The last thing you want is for your photographer to bring you to the same spots that your married friends, relatives, and acquaintances had been for their wedding shoots. Neither do you want the same photos as them. If you have the budget and lots of free time, ask a creative wedding photographer like Lito Genilo of Smart Shot Studio to accompany you to your dream destination. Collaborate with your photographer to come up with amazing and romantic concepts for your photo shoot. Then observe your guests as they watch your slide show presentations with awe during the wedding reception. One of the award-winning wedding photographers for your destination photo shoot is Lito Genilo of Smart Shot Studio. Genilo is known for capturing photos of couples set in breathtaking landscapes. His biannual participation in US-based wedding photography conventions and seminars, as well as his presence in local and international bridal fairs, has attracted a steady base of Filipino clients here and abroad. For Genilo, any location outside Metro Manila (or your home area) is a destination. However, not all destinations are the same. Some locations, like Tagaytay, do not have as much wow factor as Bali or Mexico because of its proximity to Manila. For locations to have value and impact, they must have new background and new scenery — not the same as the ones you find in Manila. “Once pabalik-balik ka sa lugar na yun, lagi mong ginagamit yang background na yan, parang wala na rin, (Once you keep returning to the exact spot and you keep using the same background, the impact diminishes)” he says. Destination shoots are advantageous to Genilo because it allows him to have unique photos of couples. “Pag nakita mo yung lugar, maglalaro na yung isip mo – kung saang angle ka pupunta at magfofocus (When you see the place, your mind plays around with angles and focus),” he says. 1. Permit: Do you need one to shoot in your chosen location? 2. Time and day: What time do you want to shoot? What time is the sunrise and sunset? 3. Weather: Check the weather report. Is the temperature outside hot or cold? Are you ready to shoot, rain or shine? 4. Season: What month will your destination shoot be? Tagaytay is good all year round except when it rains and when there is fog in the morning. Winter in New York is cold, while summer in Las Vegas is very hot. 5. Transportation: How will you and the photographer arrive at your destination? For international destinations, visas are required in most first-world countries. Couples with UK, US, Australia, or Schengen visas have higher chances of acquiring visas from other countries. On the other hand, those who have no previous history of travel may have to go through lots of interviews to have their visas approved. To avoid the hassle of getting visas, couples can opt for non-visa countries such as Singapore, Hong Kong, or other Southeast Asian countries. For faraway destinations such as the United States, couples are advised to have an overnight stay or a few day of rest before the shoot. That way, they’re relaxed and healthy on the day of the shoot. Health issues such as sleep deprivation due to jet lag or illness can cause couples to show different facial expressions instead of smiles in front of the camera. The attire or costumes for destination shoots depends on the location. The photographer is responsible for advising couples what kind of clothing to bring: casual, semi-formal, formal. What matters is that the couples don’t fight over clothing (or anything else) the night before the shoot. Otherwise, the smiles won’t show, and the couples may have to reschedule the shoot. Besides the location, other ingredients to a romantic destination shoot include couples who are game for anything and creative photographers who can take lots of beautiful photos. Genilo advises couples to find an experienced photographer for their destination shoot. If a couple goes to beautiful locations but the output from the photographer is too simple, it can be a waste of their money. According to Genilo, an experienced destination photographers adapt easily in any situation. He (or she) can do anything no matter where you bring them. He can even enhance the photos even if the couples is in locations with simple background. Anything is possible with him. Besides technique, the photographer must possess good communication skills. The first hour of any shoot must be about briefing. The photographer must talk to the bride and groom, give posing tips, and teach sign languages. That way, he can just click the shutter button without interruption. “Para di pabalik-balik yung photographer or yung couple at para di mapapaos yung boses mo sa kasisigaw (So the photographer or the couple won’t keep going back and forth and to avoid damaging your throat from shouting),” says Genilo. Some questions couples can ask the photographer include the ff: Which countries have you taken photo shoots of? Have you been to that particular location for a photo shoot? How much is your rate? Will you do an ocular inspection of the location before the shoot? 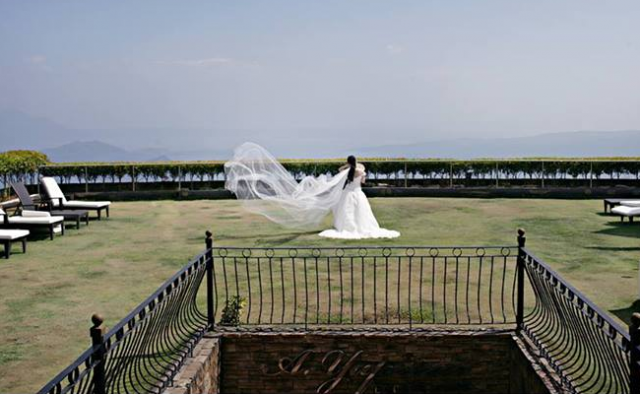 For more information about destination shoots, visit Lito Genilo’s profile at Kasal.com!